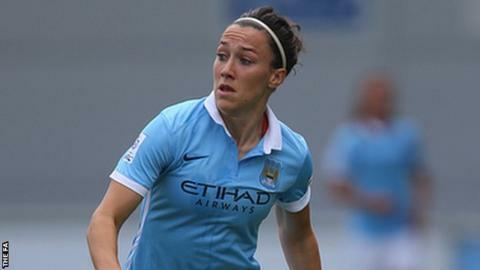 Manchester City Women's defender Lucy Bronze says the teams fighting for this season's Women's Super League One title have 'buckled' under the pressure since the international break. City have won all four of their league fixtures following the World Cup to narrow the gap on leaders Chelsea to three points, with a game in hand. Bronze says their good form has taken other sides by surprise. "If anything, it puts the pressure on other teams," Bronze told BBC Sport. "A lot of the teams have buckled a little bit under that pressure." City had gone into the mid-season break nine points adrift from the top of the table after claiming just five points from their opening five league matches. However, the club's recent wining streak has coincided with teams above them dropping points and they now sit fourth in the league. Bronze says that until now, other sides did not see them as title contenders. "We knew that as a team and I don't really think that anyone else clocked on to that because they've not really spoken about us, but we don't mind," she said. "If they want to speak about us or if they don't, that's up to them, it's for us to come in from behind and just see out the games."